Patch Hunting for Gold Nuggets. Metal Detecting Virgin Ground to Find Gold. It is a simple truth that most of the easily recoverable gold nuggets have already been discovered. This is certainly not to say that they are all gone, but the large concentrations of placer gold that many miners experienced during the early gold rushes of the 1800’s are unlikely to occur on any large scale ever again. With the being said, it is still possible for a modern day gold prospector to discover concentrations of gold that have not yet been found. One prospecting method called “patch hunting” is still a viable way to discover new concentrations of gold nuggets in new and unexplored areas. Patch hunting is quite simple in theory. It involves using a metal detector to search for gold nuggets, but it varies in the technique involved. Many people prospect for gold in known gold areas, searching the exact area that the old-timers worked with sluice boxes and drywashers many years ago. Of course there is good reason to hunt for gold in these areas; the simple fact that gold has been found there in the past makes it very reasonable to believe that there is still some gold that was left behind. Nearly all nugget shooters gravitate to these areas, as they can still be productive. There have undoubtedly been many thousands of ounces of gold recovered with metal detectors in the past few decades by reworking these well documented gold mines. The difficulty with reworking old mining ground is that these areas are generally no secret among gold miners. Most of the mining districts in the United States were originally worked in the mid-to-late 1800’s, and again in the 1920’s and 1930’s during the Great Depression. Since the advent of metal detector technology, many of these areas have been pounded. While a nugget or two can still be recovered from even the most hammered patches, it is a simple fact that most well-known gold districts have been hunted hard, and gold nuggets are getting harder and harder to find. The difference with the method of patch hunting for gold nuggets is that you are actually seeking out new and undiscovered gold deposits that have never been mined. We are talking about virgin ground; areas that have never been searched with a metal detector . There are benefits and drawbacks of this gold prospecting method. The biggest drawback (and the reason that very few people hunt for gold this way) is the fact that even the best patch hunters have to endure huge dry spells, where they find no gold at all. Gold is rare, and finding an undiscovered patch of gold nuggets is no easy task. 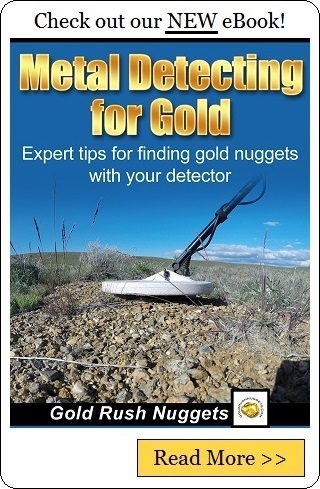 While metal detecting the well-known areas is getting less and less productive, a skilled detectorist can usually still squeak out a nugget or two. When patch hunting, you are likely to endure days, weeks, maybe even months without finding any gold. The benefit of patch hunting for gold nuggets is obvious. When you do find some gold, you are the first person to find it. If you are smart enough not to announce your discovery, you should have it all to yourself. Unlike so many gold mining areas that have been hunted by hundreds or even thousands of prospectors, the discovery is all yours. It takes a huge amount of patience and persistence, but the potential for a nice payoff is very good. So what is the best way to start patch hunting? Although successful patch hunters are exploring new ground, don’t believe for a second that they are wandering aimlessly in their search. In fact, successful patch hunters extensively research the areas that they are prospecting. They can’t be certain that they will find gold, but they are absolutely searching in a way that will increase their odds. Without research, there is almost zero chance of success. To properly research areas to patch hunt for gold, there are two very important considerations. One of these considerations is nearby mining gold mining activity. Yes, we are talking about discovering new deposits of gold, but this does not mean that we are hundreds of miles away from a known district. To the contrary, most gold patches will be found very close to well-known areas, often on the fringes of these areas. This may be several miles away, or it may be as nearby as one drainage away. We aren’t searching for the next gold rush, we are just looking for undiscovered small patches, and these are often on the fringes of known gold areas. The other aspect of research that is critical for the successful patch hunter is to understand geology and the nature of how gold is formed and deposited in the natural environment. The different types of placer deposits in an area will influence how a patch hunter searches with their metal detector. In much of the Southwestern U.S., Eolian gold placers dominate the landscape, which are often deposited very close to the surface and easily found with a metal detector. Other types of placer gold deposits will require different search methods. An extensive understanding of where and how gold is naturally deposited across the landscape that you are hunting in is critical to the success of a patch hunter. Patch hunting for gold is not for everyone. The amount of patience and persistence required to successfully find new deposits of gold using this method will test anyone’s limits, but if you can stay focused and put in a lot of hours and hard work you may just be rewarded with many ounces of gold.